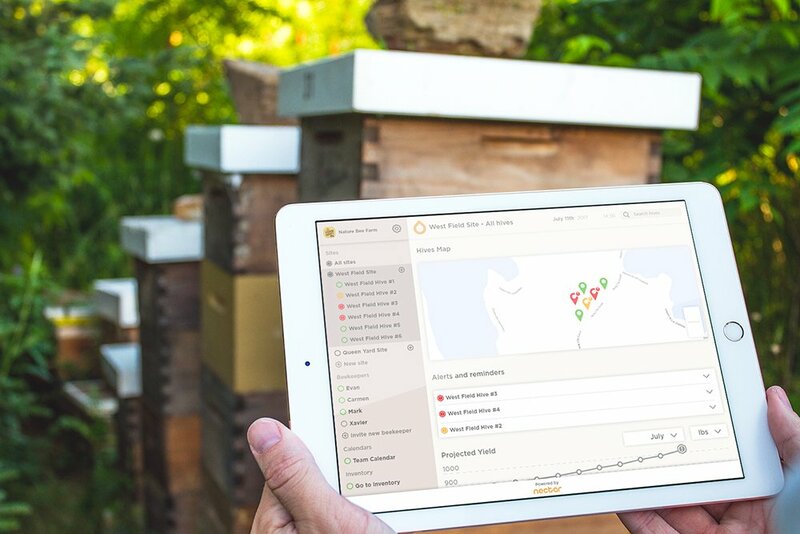 The health of honey bees is the driving force behind Nectar’s creation that is based on a remote beehive monitoring system using sensors and artificial intelligence. Professional beekeepers from Canada and the United States have been generating buzz around this Montreal start-up located in the District Central. Created in 2016, this Montreal start-up developed a remote management platform that uses sensors coupled with artificial intelligence and algorithms. With a diameter of 5 cm and a hexagonal shape, the BeeHub is placed within the colonies and is connected, via Bluetooth, to a unit placed outside of the hives. A wealth of data is collected in real time and sent to an online server (the cloud). The information gathered relates to both sounds and vibrations transmitted by the colonies as well as to movement in the swarms, but also to temperature, humidity and even geographic position…Nothing escapes this system that Xavier de Briey [one of the founders of Nectar along with Marc-André Roberge and Evan Henry] compares to an MRI in the medical sector. The buzz around such a device is to allow beekeepers to make the right decisions in the management of their winged herds, but also to save time by focusing their efforts on problematic hives. 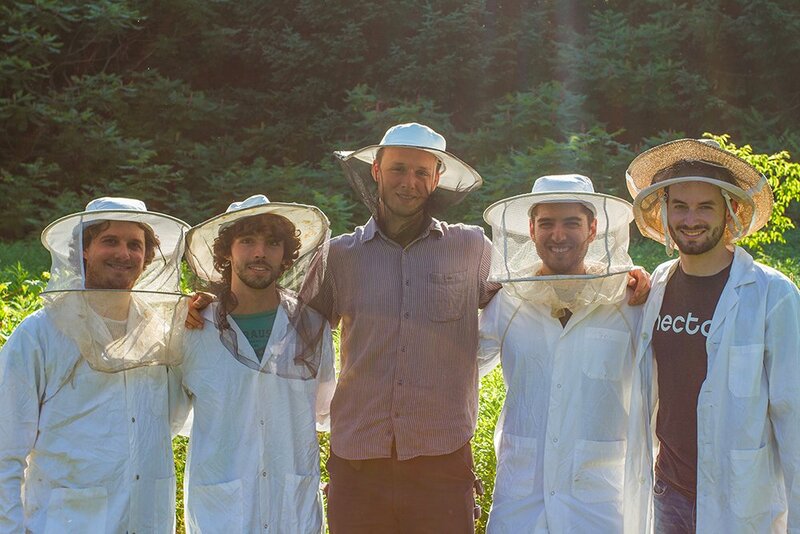 “It is a decision-making tool intended to make things easier for beekeepers”, explains Xavier de Briey, who reiterates that a healthy hive is more productive. Since its beginnings Nectar has had the time to refine its technology, with backup from outside providers for production and aesthetic components. “We are in the 6th generation of our sensor prototype”, explains Marc-André, who announced the first wave of commercialization in June, and a second in the fall. Thousands of these much-needed devices will be sent to North-American based platform subscribers. “We currently have two in Quebec, mainly in the Outaouais region, and a dozen in the rest of Canada and the United States. These are large farms that manage between 1,000 and 20,000 hives”. This year, 1,500 of these microcosms will be connected to Nectar. The question of a future expansion is still premature in the eyes of these young business owners, even if other regions in the world (Europe, South America, South Africa and Australia) have expressed their interest in this promising product, designed to withstand the wax or gum produced by bees. “For the moment we are focusing on an already large market that we want to consolidate. Our priority is to ensure that what we have built meets the needs of beekeepers with whom we have started working”. According to this young leader of only 27 years old, feedback has been very positive. 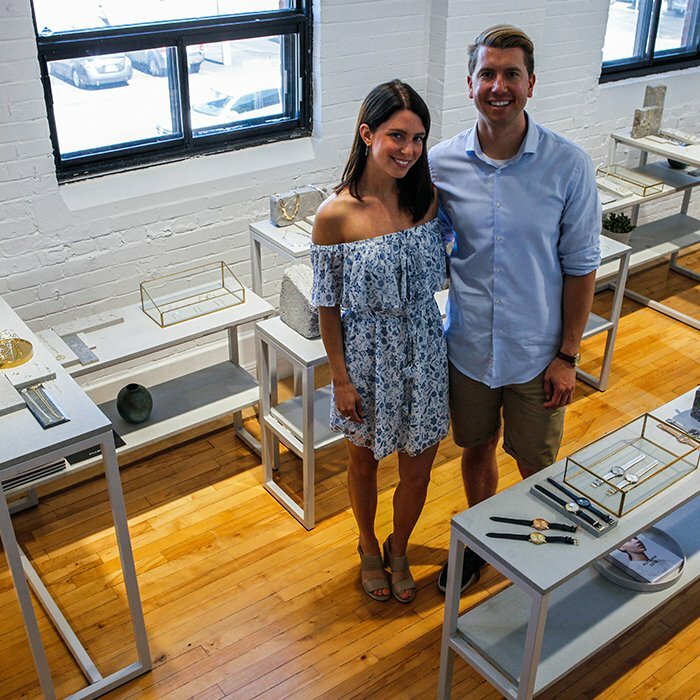 This bodes well for the start-up of 8 employees that set up shop in the District Central in August 2017, after winning a contest, giving them free rent for a year. A boost that has helped Nectar take flight, as it waits to become the next big buzz.